Welcome to Scottish Bagpipers. I’m Glyn Morris, an Edinburgh piper for hire, of 30 years experience. I provide a friendly Wedding Bagpiper and Events Piper for Hire service to add Scottish flair and ceremony to your occasion. 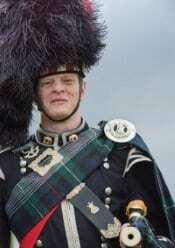 As an Edinburgh piper I have performed at countless events including weddings, dinners and parties, British Embassy functions and foreign Trade Shows, to name but a few, at home and abroad. I play for a top Grade 1 Pipe Band and I’ve had notable successes in solo piping and pipe band competitions against the world’s best. I also believe a piper must look, as well as sound the part, when playing as Wedding Bagpiper or for any other event. Therefore I dress in the finest, genuine military “No.1 Full Highland Dress”. Take my Uniform Tour to see the effort I make to look the best! Over the years I have built up a close network of Edinburgh piper friends and colleagues. I only work with pipers I have previously performed with, whom I would be happy to have play for me! I provide a unique Wedding Bagpiper service, dressed in the finest ceremonial Full Highland Dress, playing both Highland Pipes and Scottish Small Pipes for your wedding day. Have your piper welcome and entertain your guests and dignitaries for any event – Burns Supper Piper, Dinners, Tour Parties, Corporate Events, Birthdays, Hogmanay and more. You’ll want to make sure I’m a good piper! 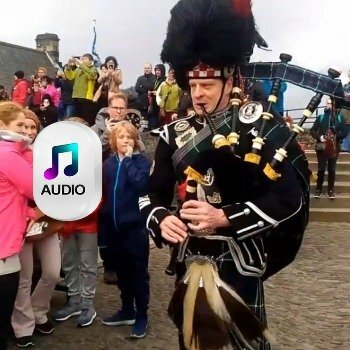 Listen to me playing both Highland Bagpipes and Scottish Small Pipes, and a selection of tunes I will play during your wedding day or special event. I only wear the finest military No.1 Full Highland Dress as my bagpiper uniform when piping at your event. See the special effort I take to look the best for your event and for your photographs! 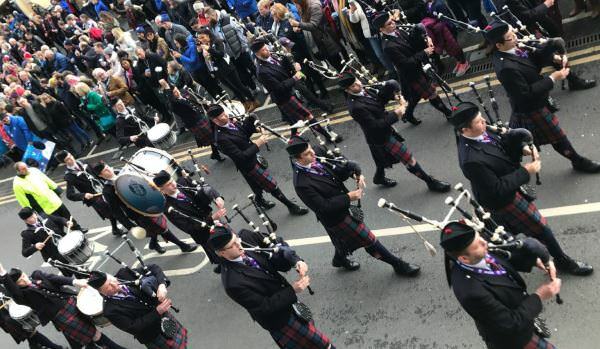 Be blown away by the Fife Police Pipe Band! Here’s what Caroline and Neil said! A very talented musician. Glyn was very friendly yet professional on our wedding day. He sounded amazing and our guests all commented on how well dressed he was. Thank you Glyn, just what we wanted for our traditional Scottish wedding.